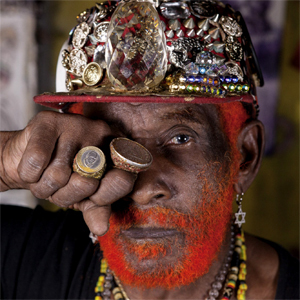 Even at his most plain-spoken Lee “Scratch” Perry is cosmic. Born in rural Kendal, Jamaica, Perry has thrived on innovation and eccentricity all his adult life. At age 82, this progenitor of dub and reggae is as timeless as he his revolutionary. In a career of more than 60 years and counting, Perry’s ambitious vision has touched millions, and shaped some of the most influential reggae recordings ever made. As an artist, he was an early adopter of sampling and disses — check out the caterwauling baby on “People Funny Boy,” his witty score-settler against a former studio boss. As a producer he is recognized as one of the pioneers of reggae sound, and of reggae music’s instrumental companion, dub, along with fellow studio wizards Osbourne “King Tubby” Ruddock, Errol Thompson, Herman Chin-Loy and Augustus Pablo. If reggae is music’s tree of life, dub is its foundation of root and stem and branch — a cellular core capable of infinite variation. Characteristically, dub takes an existing song, strips it down to its instrumental base and rebuilds it — often beyond recognition. In this sense, Perry is dub personified — bold, unusual, unpredictable. Perry began his sonic adventures working on a budget, but with a wealth of imaginative capacity. Through all of his immense success, that DIY spirit and resourcefulness remain. He’s celebrated now for his musical contributions on both sides of the microphone as he’s moved back and forth between soundboard and stage. Finishing the thought about his method, he says, “I just communicate with the Sun that rises from the East and I start to see everything and I write it in a book or in my computer.” Audiences at his live performances get to see and hear the results manifest, and leave imprinted with an out-of-this-world experience.